Padwali roti of Gujarati is also known as Swaminarayan roti because it is mostly served to al the Swaminarayan temple in India. So find this simple to make Padwali roti recipe. 1. Take a bowl and add 2 cups of wheat flour and salt. Mix it properly and add little oil. Again mix oil in the wheat. 2. Add water and knead it to soft dough. Divide the dough equally in small dumpling size ball and keep it aside. 3. Now take two dough balls and place them on the rolling board. 4. Flat them both and smear some ghee on one side of first dough and some dry wheat flour on dough. 5. Combine both the dough puris in a way that the ghee layer and the wheat flour layer touch each other. Press both of them. 6. Place the dough on a rolling board and sprinkle some wheat flour. 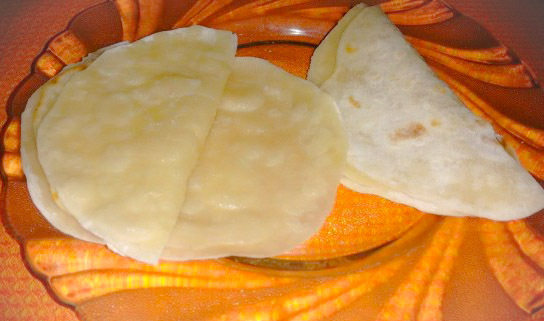 Roll the dough in a flat shape chapatti/roti. 7. Now heat a flat pan or tawa and place the rolled pad wali roti. 8. Ones bubbles turn on one side, turn it and roast the other side. 9. Roast well and normal chapatti until both sides are nicely cooked. 10. Take out the chapatti from flame and see you can easily separate the layers. 11. Smear some ghee and serve hot with sabji.